Gharavi Khansari, Maryam. (1394). Defining “Center and Edge” Concepts and Their Relationship with Durability and Dynamism in Architecture. معماری و شهرسازی آرمان شهر, 8(14), 13-22. Maryam Gharavi Khansari. "Defining “Center and Edge” Concepts and Their Relationship with Durability and Dynamism in Architecture". معماری و شهرسازی آرمان شهر, 8, 14, 1394, 13-22. Gharavi Khansari, Maryam. (1394). 'Defining “Center and Edge” Concepts and Their Relationship with Durability and Dynamism in Architecture', معماری و شهرسازی آرمان شهر, 8(14), pp. 13-22. Gharavi Khansari, Maryam. Defining “Center and Edge” Concepts and Their Relationship with Durability and Dynamism in Architecture. معماری و شهرسازی آرمان شهر, 1394; 8(14): 13-22. Assistant Professor of Architecture, School of Architecture, College of Fine Arts, University of Tehran, Tehran, Iran. -Ahmadi, B. (2004). Structure and Hermeneutics. Tehran, Iran: Game No Publishers. Research Unit of Tash Consultant Engineering, Trans.). Tehran: Tosee Press. -Alexander, Ch. (2002). The Nature of Order (Vol. 1). Berkeley: The Center for Environmental Structure. -Alexander, Ch. (2002). The Nature of Order (Vol.2). Berkeley: The Center for Environmental Structure. -Ardalan, N., Bakhtiar, L. (2001). Sense of Unity (Hamid Shahrokh, Trans.). Isfahan, Iran: Nashre Khak. -Arnheim, R. (1982). The Power of Center. California: University of California Press. -Arnheim, Rudolf (2003). The Dynamics of Architectural Forms (Mehrdad Qayyoomi Bidhendi,Trans.). Tehran, Iran: Study and Codifucation ofHumanities Books Organization. Behzadfar, Trans.). Tehran, Iran University of Science and Technology Press. -Capon, David S. (1999) Architectural Theory (Vol.1). England: John Wiley. -Clark, Roger H.; & Pause, Michael (1996). Precedents in Architecture (Saeed Aghaee, S. M. Madani, Trans.). -Documentation and Research Center, Faculty of Architecture and Urban Planning, Shahid Beheshti University (1996) Ghanjname, Vol. 2, Mosques of Esfahan. Tehran: Iranian Cultural Heritage Organization. -Ellin, N. (2006). Integral Urbanism. New York: Routledge. (Unpublished Ph.D. Dissertation). Tehran, Iran: College of Fine Arts, University of Tehran. Interdisciplinary and Disciplinary Approaches. 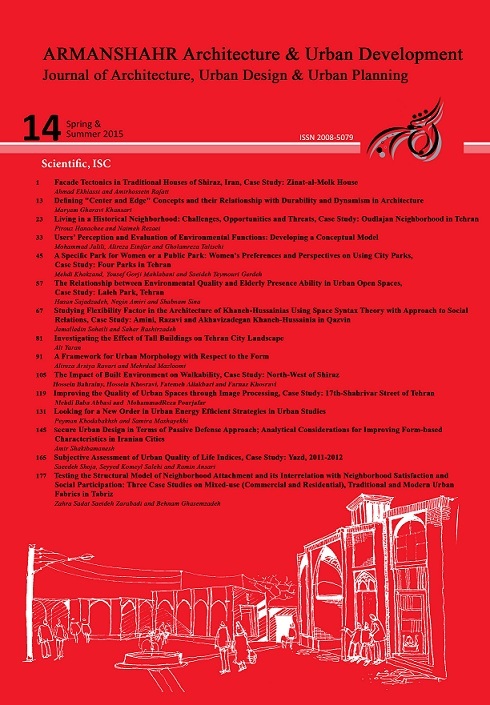 Armanshahr Architecture & Urban Development Journal, 10, 43-54. -Ghezelbash, M., Abouzia, F. (1985). Alphabets of Yazd Traditional House. Tehran: Program and Budget Organization. -Giurgola, R. (2005). Louis Kahn (A. Jabalameli, Trans.). Isfahan, Iran: Nashre Khak. -Habraken, N. J. (2000). The Structure of the Ordinary. Cambridge: MIT Press. -Hamidi, M. (1997). The Skeleton of Tehran, Vol. 1. Tehran: Technical and Construction Assistant of Tehran Municipality. -Herdeg, K. (1997). Formal Structure in Islamic Architecture of Iran and Turkistan (Translation andResearch Unit of Banian Consultant Engineering, Trans. ).Tehran: Youm Press. -Hillier, B., Leaman, A. (1972-3) Structure, System and Transformation. In Transactions of the Society Bartlett (Vol. 9, pp. 36-77). London: Bartlett School of Architecture, University College. -Jacobs, J. (2007). The Death and Life of Great American Cities (H. R. Parsi; A. Aflatouni, Trans. )Tehran: University of Tehran Press. -Lang, J. (2004). Creating an Architectural Theory (Alireza Einifar, Trans.). Tehran: University of TehranPress. Hossein Bahrainy, Trans.). Tehran, Iran: University of Tehran Press. -Mozayeni, M. (1994). Issues on City and City Planning. Tehran: University of Tehran Press. -Norberg-Schulz, Ch. (2002/1). The Concept of Dwelling: on the Way to Figurative Architecture (M. A.Yar Mohammadi, Trans.). Tehran: Agah Publications. -Norberg-Schulz, Ch. (2002/2). Architecture: Presence, Language, Place (Alireza Ahmadian, Trans. ).Tehran: Memar Nashr Press. -Paumier, Cy (2010). Creating a Vibrant City Center (M. Behzadfar & A. Shakibamanesh, Trans.). Tehran:Iran University of Science and Technology Press. -Salingaros, Nikos A. (2008). A Theory of Architecture (Saeed Zarrin Mehr & Zahir Mottaki, Trans.). Tehran:Iran Architecture and Urbanism Studying and ResearchCenter. -Schneider, Tatjana & Jeremy T. (2007). Flexible Housing. Oxford: Architectural Press.